Ever since World War II, Cadillac was the undisputed luxury car king until the 1980s. The Corporate Average Fuel Economy (CAFE) standards which went into affect in the late-1970s had killed what remained of large displacement V8 engines. This was bad news for Cadillac which had built its success on the selling big opulent luxury cars powered by large displacement V8 motors. Before CAFE took effect, Cadillac produced the largest displacement V8 to see duty in a production car – the 500 CID (8.2 liter) V8 which had a 4.30 inch bore and 4.304 inch stroke. The 500 V8 was based on the large Cadillac V8 engine block that first saw duty as the 472 CID V8 (4.30 inch bore and 4.06 inch stroke) for 1968. The last year for the 500 V8 was 1976 which also happened to be the last year for the gigantic full-size Cadillac – the 1976 Fleetwood Brougham sedan which had a length of 233.7 inches, width of 76.4 inches, and a wheelbase of 133 inches. Never again would a Cadillac automobile be that big. The full-size Fleetwood Brougham sedan would go on a diet for 1977 shrinking to more modest full-size proportions – a length of 221.2 inches, width of 75.3 inches, and wheelbase of 121.5 inches. To go with the smaller Fleetwood, Cadillac reduced the bore on its 500/472 V8 block to 4.08 inches and used the 472’s 4.06 stroke to come up with a 425 CID V8. The 425 in the dark days of the late 1970s provided more than enough horsepower and torque to satisfy customers. The 4-bbl equipped 425 produced 180 horsepower and 320 lb-ft of torque and the fuel injected 425 produced 195 horsepower and 320 lb-ft of torque. The 425 lasted through the 1979 model year and sales couldn’t have been better. By 1980 with the CAFE noose tightening around Cadillac’s neck, it was forced to reduce the bore of the 425 to 3.80 inches and it kept the the 4.06 inch stroke of the 425/476 – the result was a (6.0 liter) 368 CID V8. Power unfortunately took a nose dive to 145 horsepower and 270 lb-ft of torque for the fuel injected 368 and 150 horsepower and 270 lb-ft of torque for the 4-bbl equipped 368. These figures were still better than many of the competition Unfortunately even though fuel efficiency was much improved over the 425, the 368 was not good enough for an encore presentation in 1981 without some modifications to satisfy the choking CAFE standards. GM had at the time a corporate policy that it would not pay or pass on the cost to the customer of the dreaded gas guzzler tax which was the penalty for not meeting CAFE. Cadillac thought it had the answer for 1981 – a 368 V8 equipped with computer controlled cylinder deactivation. Today that may not seem like a large undertaking since GM, Chrysler, and other automakers have reliable cylinder deactivation systems in some of their current product offerings, but back in 1981 when computer technology was in its infancy, it was a big gamble. 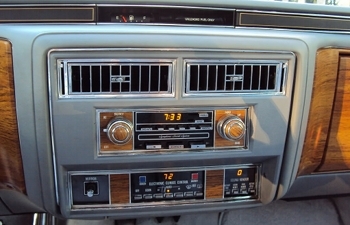 Cadillac compared to other automakers had been at the forefront of computer technology in the 1970s, implementing state of the art electronics and computer technology with its cars having a array of computer controlled digital dash readouts. One such readout even gave occupants the exact mpg of the motor at any precise moment – this system was called the MPG Sentinel. Cadillac’s first implementation of a computer controlled port injected V8 in the mid-1970s was a big success. Chrysler rolled out its fuel injection system a few years later and encountered a host of problems. However with the the cylinder deactivation equipped 368 which was marketed by Cadillac as the "V8-6-4" (Cadillac called its new cylinder deactivation system "Modulated Displacement"), was nothing short of a disaster. The idea was innovative and even technologically sound – the V8-6-4 would use eight, six, or four cylinders depending on the what the power requirements of the engine were at any particular time. In other words during acceleration all eight cylinders would be used and when cruising on the highway four cylinders would be used while in some situations in between, six cylinders would be used. The problem wasn’t mechanical, for the concept was simple, solenoids mounted on the rocker arm studs (above each cylinder that could be deactivated) would close the valves of the cylinders not needed at a particular time. When cylinders were deactivated they still moved in conjunction with the cylinders in use. What the closed valves did was keep the deactivated cylinders from participating in the combustion process. Since the cylinder was still in motion, once a cylinder was reactivated (by the computer) the valves of that cylinder would re-open and the cylinder would again be a part of the combustion process. And when cylinders were deactivated the computer would adjust the fuel/air flow from the engine’s throttle body fuel injection (TBI) system to compensate. Unfortunately the problem was computer related. Visualize the V8-6-4 being controlled by one of Bill Gate’s former buggy Windows computer operating systems such as Millennium and you get the idea. Drive-ability suffered under this system with such issues reported by customers as delayed cylinder activation or deactivation causing lag and bucking being felt during acceleration due a computer delay or miscalculation. The V8-6-4 became a real headache for owners and Cadillac mechanics. Today’s modern cylinder deactivation systems have much more sophisticated central computers that can detect and make changes in milliseconds, so with these modern systems most drivers can’t detect the cylinder deactivation and activation – it’s seamless. Cadillac to its credit did try to remedy the situation with the V8-6-4 as best as it could. It offered several prom upgrades to the central computer, the latter versions of which did help to make the V8-6-4 a much more drivable motor. However for many owners, it wasn’t fast enough since their patience was wearing thin. Cadillac dealers didn’t have the luxury of waiting for a future prom upgrade that would alleviate the problem. Most dealers took the easy route and just deactivated the Modulated Displacement system which in effect converted the V8-6-4 368 into a 368 V8 that ran on all eight cylinders all the time. With this corrective fix, fuel efficiency may have dropped but customers didn’t care they were just happy having a smooth and predictable V8 engine under the hood. The V8-6-4 (6.0 liter) 368 was rated at 140 horsepower and 265 lb-ft of torque, which was a little light on the horses but did provide plenty of torque. Most Cadillac buyers were more interested in torque so the engine did deliver on that accord, the 368 had enough torque to move the 4,204 lbs Cadillac Fleetwood Brougham sedan smoothly. Interesting to note that the V8-6-4 368 came standard with the heavy-duty and very reliable TH400 3-speed automatic transmission – a transmission which had been phased out of other GM cars a few years beforehand since it was so heavy. As previously mentioned Cadillac was scrambling to meet the CAFE standards which is the main reason it took the V8-6-4 gamble. However Cadillac took another big gamble on the Fleetwood Brougham by offering a V6 for 1981 – the 125 horsepower 205 lb-ft of torque Buick 4.1 liter V6. This (4-bbl) 4.1 V6 was a reliable motor but it was slower than a nearly dead turtle, it barely moved the 3,854 lbs Fleetwood Brougham sedan (the curb weight was lighter than V8-6-4 Fleetwood Brougham). Back in 1981 diesels were still the rage, and on the Fleetwood Brougham option list was the Oldsmobile Diesel 350. 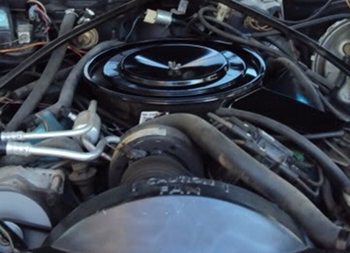 This motor for 1981 had new improvements and was a better engine than the previous 1978-1980 Oldsmobile Diesel 350. The newer version was rated at a paltry 105 horsepower and 205 lb-ft of torque. It didn’t matter what engine was ordered with the 1981 Fleetwood Brougham, the interior cabin was as quiet as church mouse even with the diesel. Same was true no matter what the road conditions were – passengers were privy to a limousine quiet ride in the Fleetwood. The suspension absorbed even the harshest of bumps and road imperfections. Surprisingly the 1981 Fleetwood Brougham for a large luxury car handled the curves better and had better steering response than its predecessors. The Fleetwood Brougham came in two body styles – a 4-door sedan and a 2-door coupe. The sedan was the popular choice in 1981. Cadillac began offering a coupe version of the Fleetwood Brougham in 1980 in an attempt to capitalize on the growing popularity of two door luxury cars. The coupe unfortunately never really caught on with Fleetwood buyers, so 1985 would be its last year. CAFE may have sapped a little of that Cadillac spirit under the hood but everywhere else the Cadillac was better than ever. In 1980 the Fleetwood Brougham had a facelift and rear update – the end result was a stunningly beautiful and stately full-size car. This slight 1980 restyling was such a success it remained intact with no exterior changes through 1989 – a very smart move on Cadillac’s part not to mess with success. The rear had a modern version of the traditional Cadillac tailfins which blended well with the squared off trunk area. The frontal area had quad (square) headlights surrounding an elegant front grille. The Fleetwood Brougham had the boxy styling that was very popular in the early to mid-1980s among luxury car buyers. In 1981 Cadillac had its pulse on what type of luxury car styling buyers wanted – as proof sales were doing very well across the entire Cadillac lineup. 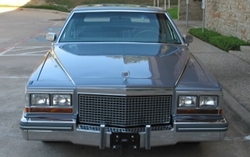 Fleetwood Brougham sales when compared to 1980 were up 20% for 1981 to 39,800 units (31,500 sedans and 8,300 coupes). This was astonishing considering the U.S. economy was in bad recession during the 1981 model year and the Fleetwood Brougham had a base price of around $16,000 which with some extra options easily pushed the final sticker price to or very close to the $20,000 mark which in 2012 dollars would be around $50,000. The U.S. Prime Interest Rate hit a sky-high 21.5% in December 1980 which was right smack in the early part of the 1981 model year (the 1981 model year started in September of 1980). Ultra high interest rates should have killed Fleetwood sales since all car loans during this time had eye-watering high interest rates. To put this into perspective, it would be like buying a new $50,000 luxury car today (in 2012) and financing $20,000 to 40,000 for this car at around 20% interest – not a very enticing proposition. This proves what a strong appeal the Fleetwood Brougham had among luxury car buyers even in the bad economic times of the 1981 model year. 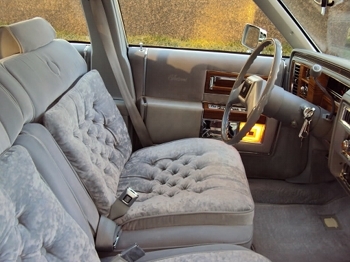 And when it came to the interior, there was not a more luxurious car available in 1981 than the Fleetwood Brougham. 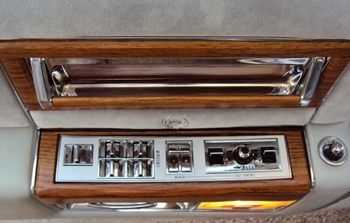 Plush carpeting, wood grain dash and door pieces, and some of the most comfortable pillowy seats a buyer could imagine – it was all there in the Fleetwood Brougham. Not to mention all the electronic gizmos one could imagine as standard equipment such as the MPG Sentinel, an automatic digital readout climate control system, and on-board computer diagnostics. The on-board computer diagnostics which was only available with the V8-6-4. It was an innovative system that allowed an auto technician when inside the passenger cabin, to push two buttons to obtain diagnostic information concerning the V8-6-4 when the "Check Engine" dash light would appear. This on-board system was especially helpful with providing error codes and information concerning the V8-6-4 which helped a technician quickly pinpoint a problem. And when the repair job was completed the technician could be assured the problem was fixed by checking the on-board diagnostic system inside the cabin – a display of the "70" code on the digital display would let the technician know that everything had been fixed. If a Fleetwood buyer wanted the ultimate in luxury for 1981, there was nothing more opulent than the special edition Fleetwood Brougham d’Elegance. It was bar none the ultimate full-size luxury car experience. Back in 1981 the Fleetwood Brougham d’Elegance was the "in car" that would make one the envy of all at the local country club. It was a car that announced to everyone that you had made it – you were a financial success story. The special edition d’Elegance was available in both sedan and coupe body styles. The d’Elegance had a unique interior which consisted of ultra plush and very comfortable pillowy tufted cloth seats. Plush pillowy leather tufted seating could was also available on the d’Elegance. Both the d’Elegance cloth and leather seats had a Cadillac leaf crest insignia on the seat backs. On the exterior of the car, d’Elegance badges could also be seen. D’Elegance in French means elegant taste and discriminating beauty – terms that perfectly described the unsurpassed luxury and beauty of the Fleetwood Brougham d’Elegance – it may have been a mouthful to say the full name, but one look at the exterior and entry into the interior made the average person speechless from amazement. Even by today’s standards this car is opulent, so going back 31 years you can easy see how ahead of its time this car was. It’s a shame that CAFE had to spoil things. The next year Cadillac kept the luxury level up but the the V8-6-4 was replaced by a new 135 horsepower (195 lb-ft of torque) HT4100 (4.1 liter) V8 – another byproduct of CAFE. Cadillac would soon see dwindling sales – it would mark the beginning of Cadillac’s losing market share to Mercedes and BMW. A trend that Cadillac has never fully recovered from. In hindsight Cadillac back then should have just thumbed its nose at CAFE and just passed the (CAFE) gas guzzler penalty to its customers like Mercedes and BMW did during the 1980s and 1990s. If it had, there may still be a rear-wheel drive Fleetwood Brougham Sedan d’Elegance in the current 2012 Cadillac lineup and Cadillac could still be considered the luxury car standard of the world as it once was. Don’t for a second think there’s no connection between Cadillac currently not having a flagship rear-wheel drive full-size luxury sedan like the Fleetwood Brougham d’Elegance in its 2012 lineup and Cadillac being a long way from regaining its former luxury car standard of the world title. Some of the old timers who were there back in day and still are employed at Cadillac will probably tell you the 1981 Cadillac Fleetwood Brougham Sedan d’Elegance sedan is sorely missed. On the other hand the V8-6-4 is one motor they would certainly like to forget. Cadillac in 2012, now has in its arsenal an assortment of GM’s powerful and reliable motors (which include some impressive V8 motors) – Cadillac just needs a new beautifully styled rear-wheel drive Fleetwood Brougham d’Elegance as its flagship to bring it back into prominence. If Cadillac does heed this advice, hopefully it will this time around thumb its nose at CAFE (which is rapidly ascending upwards again), and never skimp on horsepower or release an engine technology prematurely in order to meet these ridiculous standards. A true luxury car deserves better than a CAFE crippled motor – the 1981 Fleetwood Brougham Sedan d’Elegance certainly deserved better.